The Golden Gate National Parks Conservancy offers a wide assortment of publications to keep park lovers informed. Our annual reports to the community illustrate all of the year-to-year accomplishments that would not have been possible without the continuing support of volunteers and members. Become a member and you'll get the quarterly Gateways newsletter, which contains breathtaking park imagery and info on special community events, park projects, volunteer opportunities, and much more. Or subscribe to the monthly Park E-ventures email for the latest on the parks by clicking here. Share the beauty and wonder of the Golden Gate National Parks with our free Facebook Timeline cover images. Annual financial statements from the Golden Gate National Parks Conservancy. In addition to all the individual publications above, check out our latest stories about park happenings below! The Spring Equinox is almost upon us and it’s the time of year when we all wait for the rains to get the wildflower show started. At the Redwood Creek Nursery, though, we are collecting something a little different this year. For 15 years (as of April 2012), students at Oceana High School have been growing plants on campus for restoration projects in the parks. See what they have accomplished at this sixth Parks Conservancy native plant nursery—and learn how they took the initiative to expand their green oasis. 2012 marks a decade of Trails Forever—a tremendously successful initiative to improve trails and habitats across the Golden Gate National Parks. Take a walk down memory lane and check out images capturing our favorite Trails Forever moments. A dry and relatively warm winter means the wildflowers are popping early this year (2012)! In March, the parks start unfolding their spectacular spectrum of color. Read on for our park botanists’ favorite petal-peeping spots. Want your middle school student to get a job this summer? 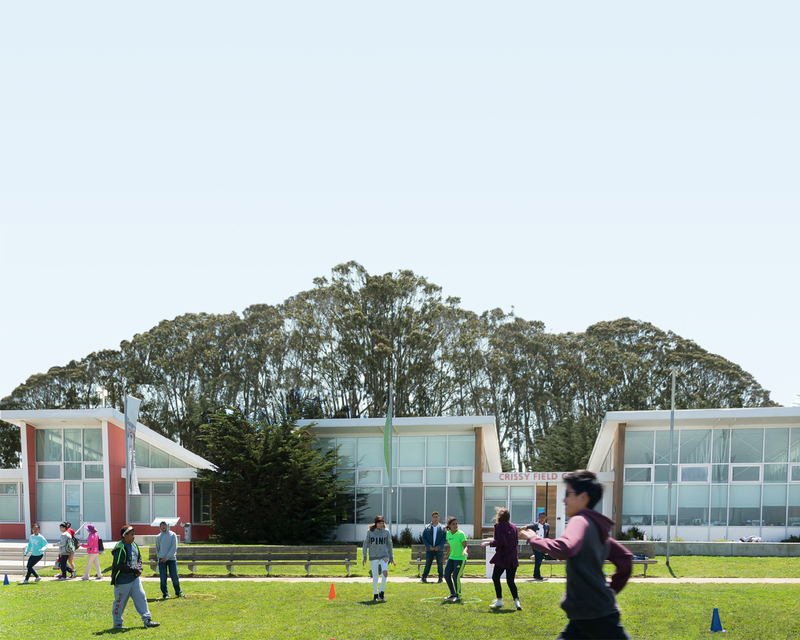 Consider applying for Urban Trail Blazers, Crissy Field Center’s paid internship program for middle schoolers. Interns will explore their national park, complete various art projects, and have fun this summer—all while getting paid! Balancing precariously on the strong March winds, stilling Red-tailed Hawks are easy to spot in the Marin Headlands. But what’s the driving force behind this aerial feat? What adaptations do these majestic raptors rely upon to perch in the sky? We recently caught up with some of the environmental leaders who participated in a Google Earth Outreach training workshop last year at the Institute at the Golden Gate. Read on to see how they are using mapping technology. Also, learn details about the next workshop! A Shamrock or a Sham? Shamrocks are one of the quintessential symbols of the St. Patrick’s Day holiday, but have you ever wondered how these cute green icons compare to plants we see in the wild, here in the Golden Gate National Parks? The National Park Service Trail Crew and Interns have built a new boardwalk at the entrance of Muir Woods National Monument. Get the inside story on how this magnificent new way into the woods was completed. Just in time for Valentine’s Day, we asked our field staff to share their favorite romantic trails—perfect for first dates, soul-soaring walks, and maybe even popping the question. Read on to see the sites and hikes our park experts recommend.